It is not clear whether it is allowed to access Musical Fountain Shows or Musical Gardens or not, if you are under 26 years old. 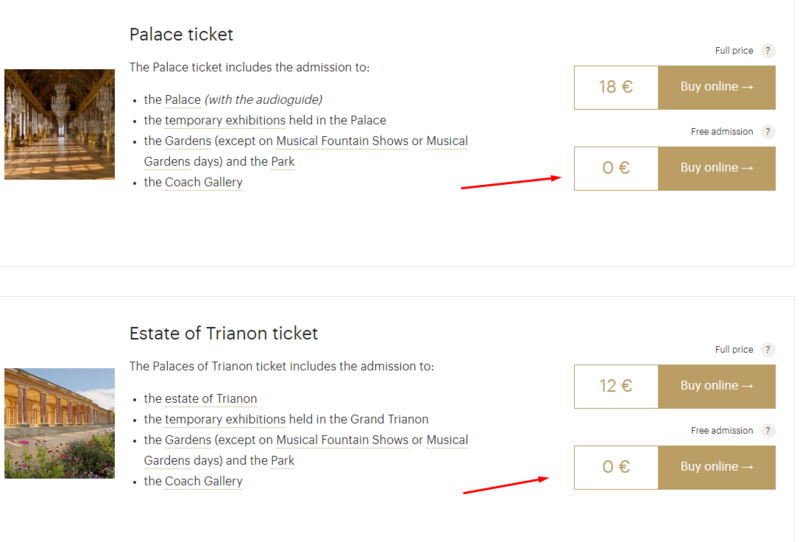 It's OK, if you are with this kind of ticker you can visit Palace of Versailies and the estate of Trianon, also you can visit Fontains and Musical Gardens, but only if there is not a shows, am I right? Probably if you want to visit only palace with the gardens and fountains and if you want to visit Estate of Trianon but not the palace, am I right? If I got free submission but want to access fountains shows and musical gardens, I should pay price - 10 euro, but cannot find where to do it online, any ideas? And want to visit it in Tuesday, I cannot visit the gardens and the fountains, because there is a shows, right ? Everything is free if you are under 26 years old, also the Trianon. There is just an exception: you can't visit the gardens when there are the musical fountains shows. Attention, on days with Musical Fountains show or Musical Gardens, access to the Gardens is free only for children under 6. Tickets for the Musical Fountains Shows or the Musical Gardens can be bought online or at the entrance of the Gardens. If you are under 26 you can get a reduced rate by buying tickets for the musical show and clicking "reduced rate" when you choose the number of tickets to buy. Not the answer you're looking for? Browse other questions tagged france budget paris versailles or ask your own question. 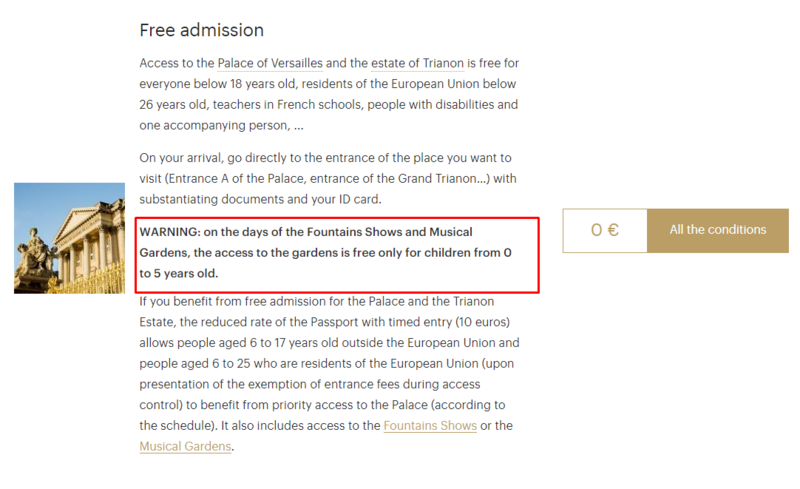 How to avoid paying for musical gardens if visiting Versailles Palace on a Tuesday? As an Indian citizen travelling to Portugal, should I book my plane tickets or apply for my Schengen visa first?